Middlewich Town Council. This is a current project which should be going live in spring 2010. 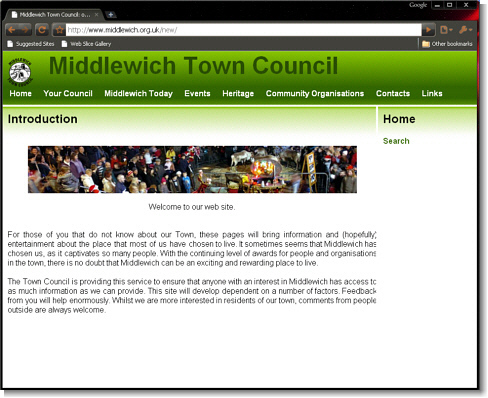 The web site development is finished and delivered to the Middlewich Town Council. A specific request had been that the council officers should be able to edit the site themselves without needing any specialist skills other than might be expected of the average word processor user and that has been done. 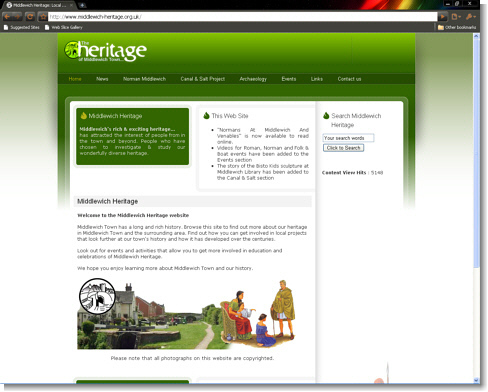 So, since delivery the council staff have been busy preparing the content in a local copy of the web site. A forum was also requested and once again control was desired by the council so a Google Discussion forum has been added. Once the content is complete it will replace the old site. Middlewich Heritage. Middlewich is a rural town in Cheshire that has a long diverse history and Middlewich Heritage - a project initiated by Middlewich Town Council - seeks to make this history available to all. The project has many facets and one involves having a web site as reference point for the activities of the project. Originally my job was to organise the JOOMLA 1.5 content management system however I have also been involved in creating articles where file conversions have been required, such as Tim Stricklands book "Normans At Middlewich And Venables". As the Middlewich Heritage project is ongoing this site telling of Roman and Norman times as well as the industries surrounding the canals & salt will continue to develop. 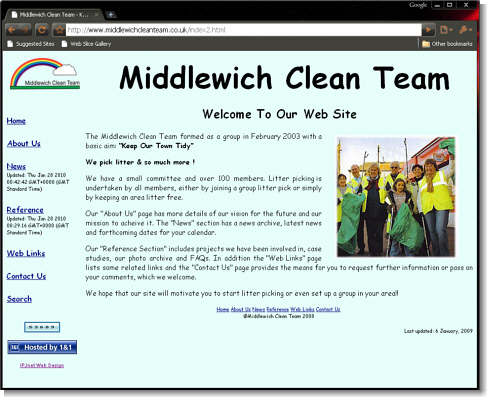 Middlewich Clean Team. Middlewich is a small market town situated in the heart of Cheshire. The Clean Team formed as a group in February 2003 with a basic aim: "Keep our town tidy". They now have over 100 members undertaking litter picking, whether it be by joining a group litter pick or simply by individuals keeping an area litter free. The clean have extended their activities in a number ways such planting bulbs & Flowers and supporting local events. They have been very succesful in using their website to promote their activities and consequently motivate others into starting litter picking or even setting up clean teams in their own areas. 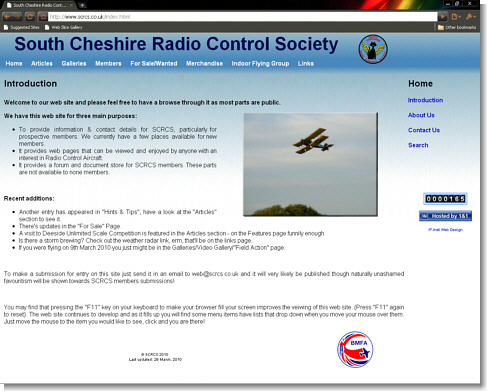 South Cheshire Radio Control Society SCRCS is a radio controlled model flying club operating from a grass strip near Middlewich in Cheshire. Fixed wing, helicopters and gliders are all flown using i.c. or electric power. The society is affiliated to the British Model Flying Association (BMFA). This is a fairly recent development to replace the web site I originally created about some years ago and was beggining to show it's age. The web site helps maintain membership levels and provides members with a forum and a wealth of articles to support their sport. 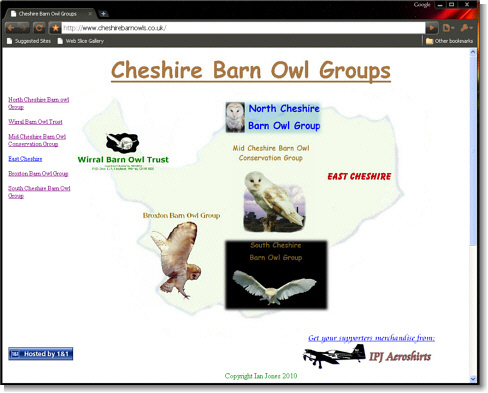 Cheshire Barn Owl Groups Originally the web site of the Mid Cheshire Barn Owl Conservation Group which I created in 2003 and has since been extended to cater for the rest of the barn owl groups in Cheshire. The barn owl is in decline throughout Great Britain and the groups are reversing this trend in Cheshire. This web site provides information about the groups and of course the barn owl itself. Barn Owl sightings are reported through the web site and it also provides the means to contact the groups and find out what can be done to help. Barnstormers. 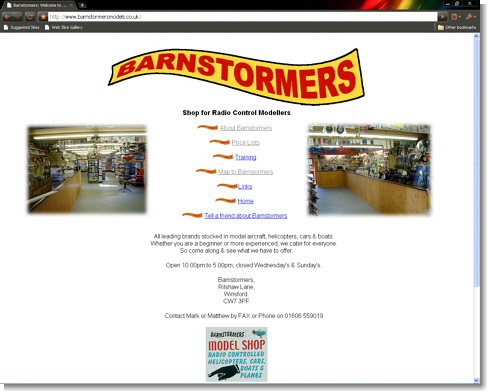 Barnstormers is a model shop supplying all the main radio controlled helicopters, cars, boats & aeroplanes together with all the accessories & spares to keep them going. Situated at a farm in the heart of the Cheshire countryside it is in a central position in the county but slightly off the beaten track. The initial web site was therefore to provide information about the shop and all important directions on how to get there. This has helped the business a great deal and since then an online shop (by another provider) has been linked to it.